Easy to make Christmas-themed felt decorations grouped together by color and produced using a few embroidery stitches. Cut out two identical bell patterns from the thick red felt (see below). Then embroider some stars in silver embroidery thread, then the holly leaves (embroidered "freehand" using a crewel or stem stitch) with a pine green thread, while the red holly berries will be embroidered in a lighter red than the felt, using the satin stitch. A zig-zag stitch using a light green thread will help bring the 'flared' shape of the bell to the fore. The two sides of the bell can now be fitted together: they must be embroidered (with a herringbone stitch, for example) in silver thread all the way round the bell, leaving a gap where the bell will be suspended (to allow space for a ribbon) and leaving the very bottom of the bell unstitched. 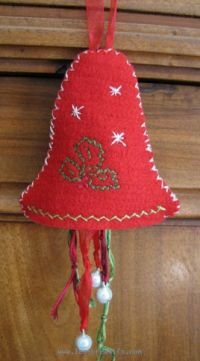 A jumble of red muslin ribbons and plaided and knotted embroidery threads (various greens and reds), from which a few small metal bells are hung, are attached to a ribbon which comes out at the top of the bell, and from which the bell can be hung. 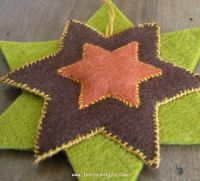 Cut out the large star (see pattern below) in thick olive-green felt, then the medium-sized star in thinner brown felt and lastly, the small, innermost star in thin orange felt. 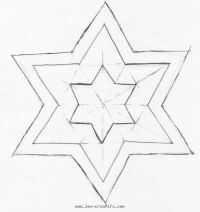 Fasten the two bigger stars together, so that their points are not aligned with each other, using a blanket stitch (3 strands) to which will be added a thread (of the same color - 6 strands) that will go right round the edges of the brown star. 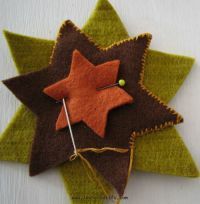 Attach the small orange star, using a yellowish-orange embroidery thread (2 strands). First place a circle of felt under this star to give a more '3D' effect. Embroider using small stitches. 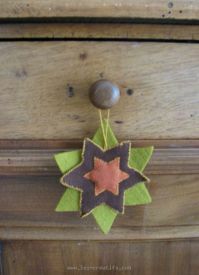 Attach a long loop of thread to the brown star, from which you will hang the decoration. Cut the pattern for the mitten out from thick yellow felt and another from thin orange felt. Cut out assorted designs and motifs from scraps of thin felt. Using the applique technique, stitch on these motifs, using thread colors that contrast with the motifs they're sewn on, but match the other colors of the mitten. Embroider little crosses for a more 'rustic' feel. The two sides of the mitten are now attached using the blanket stitch, and a loop in brown leather is attached to the inside of the mitten.